Matt does a great job here summarizing my favorite points in the book. I LOVE the After Action Review! Read on! 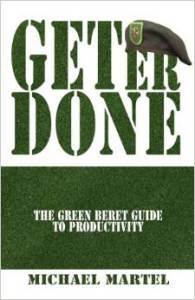 I just finished reading a short book from the LIFE Leadership development system titled “Get Er Done – The Green Beret Guide To Productivity” by Michael Martel, a former Green Beret (as I would expect). It is a short, easy-to-read book with a lot of good wisdom. One section in particular is titled “Who Are They To Judge.” I was pleasantly surprised to discover it was not a typical chapter on critics and how to deal with them, as I had originally assumed. Have you ever attempted to do something and have been questioned by someone, probably negatively, why you would do that? Prior to your friend’s query, you probably spent time in thought and prayer, studied the potential reward and consequences, acquired special insight and information and, with all positive intentions, decided to move forward and then, WHAM! You get hit with seemingly unwarranted criticism, rejection and negativity.